The OCEANTEC Wave Energy Converter (WEC) is a novel offshore floating device that can be classified as a linear absorber or attenuator. The way it extracts energy form ocean waves is based on the relative inertial motion that waves cause in a gyroscopic device. This motion is used to feed an electric generator through a series of transformation stages. The gyroscopic device is located inside a lengthened structure or hull that stays aligned with the wave front, resulting in a pitching motion. The structure that comprises the absorber and the rest of the elements has a vessel-like design and a scalable size. This size is adapted to the predominant sea climate of the selected location. For instance, in a location with predominant wave periods between 10 and 12 s (typical of the Northern Coast of Spain), the length of the structure can range 40 to 60m. Oceantec Energías Marinas SL is no longer pursuing the OCEANTEC 1:4 prototype due to the cost of the construction of their 1:1 OCTEANTEC Wave Energy device. Electrically, the results of the energy harnessed from the waves with the 1:4 prototype has been satisfactory. The sea trials have been carried out in Cala Murgita, situated between Pasaia and San Sebastian, in the Northern Coast of Spain. The centre of the test area selected is placed in coordinates: XUTM(= 585.52 m; YUTM(= 4.799.033m. This area has a depth of 29-30m and is characterized by a sandy seabed. Initial 12 month permit during testing period (starting july 2008). Later extended for another 12 months. Identification of the WEC concept and starting of the conceptual design was made in 2005. Following the identification of the WEC, in 2006, the International Patent of the OCEANTEC WEC was filed. The Technology was validated through Numerical Simulations and Laboratory Tests (Phase 1) in 2007, also the search for investors started the same year after the validation. In 2008 a €4.5m Investment led by IBERDROLA was obtained, and the Technology entirely was transferred to OCEANTEC ENERGÍAS MARINAS, SL. Sea trials of a quarter scale prototype (Phase 2) was carried out in the same year as well. In 2009 a Power train manufacture & integration was made. 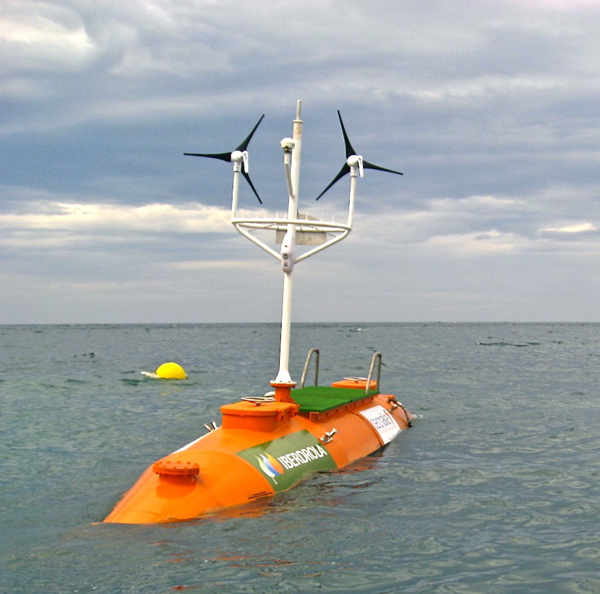 OCEANTEC Wave Energy Converter 1:4 prototype is located in Spain. Fernando Salcedo, Pablo Ruiz-Minguela, Raúl Rodríguez, Pierpaolo Ricci, Maider Santos. “OCEANTEC: Sea trials results of a quarter scale prototype”. 8th European Wave and Tidal Energy Conference (EWTEC), Uppsala (SWEDEN). Ruiz-Minguela, J.P.; Rodríguez, R.; Ricci, P.; Marón, A.; Prieto, M.E. ; Fernández, D.; Taboada, M. “Design and Testing of the Mooring System for a New Offshore Wave Energy Converter”. 2nd International Conference on Ocean Energy (ICOE 2008), Brest (FRANCE).